There is no denying it. I am middle-aged. The latest evidence is the progressive-lens glasses. I had tried to put off getting these for as long as possible (warning to you younger readers — they are not cheap!) but it was just getting too difficult without them. We pretty-well take for granted good vision, but most of us can only enjoy really good vision by virtue of really good lens-making methods. In my case, while my vision was fine while at school, it became apparent rather quickly at university that mine wasn’t as good as some of my friends. Sat at the back of one of the large lecture theatres I really couldn’t kid myself that I had good eyesight. I couldn’t read what was on the screen at the front, while others around me could. While my vision isn’t so bad that I’d walk into things without my glasses, or be unable to read bus numbers on the front of buses*, I’m obviously short-sighted, meaning that I can happily look at things close to me (up to a couple of years ago, anyway), but far-off objects just can’t be focused. In terms of the physics of my eye, the focusing is mostly done by the cornea (which I don’t have control over), and then a little by the lens. Muscles squash or stretch the lens in order to focus an image — a squashed lens is more powerful than the unsquashed lens and focuses the image closer to the lens**. But in my case far away objects are focused in front of the retina and I can’t stretch my lenses enough to bring the image into focus onto the retina. To correct this, I need diverging lenses in my glasses. But that’s not all there is to it. 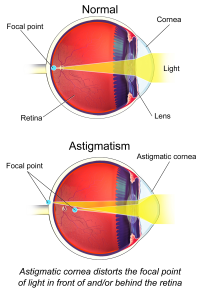 I also have astigmatism, meaning that my corneas are not rotationally symmetric. They have different focal lengths for objects at different orientations. This means the lenses in my glasses need to have different strengths in different orientations. Unfortunately, now that’s not all there is to it either. My lenses (the ones in my eyes) can’t squash and stretch as much as they used to. This means that, despite being near-sighted, I now have trouble reading. For close-up work, I need a (slightly) converging lens. That’s awkward — diverging for distance, converging for close work. Some people manage that by having two pairs of glasses, but since in my work I am constantly switching between close-up work and long-distance work and mid-distance work it would make for a logistic nightmare. 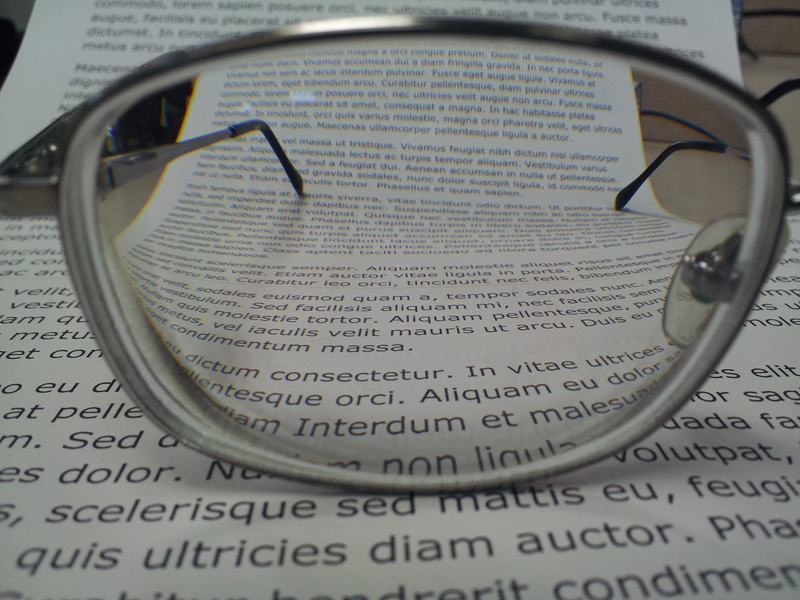 Some people have bifocal lenses (including a small piece at the bottom for reading, but the rest of the lens the usual prescription). And some have progressive lenses. Progressives are rather neat and as a physicist I find it amazing that they work in practice, as well as in theory. 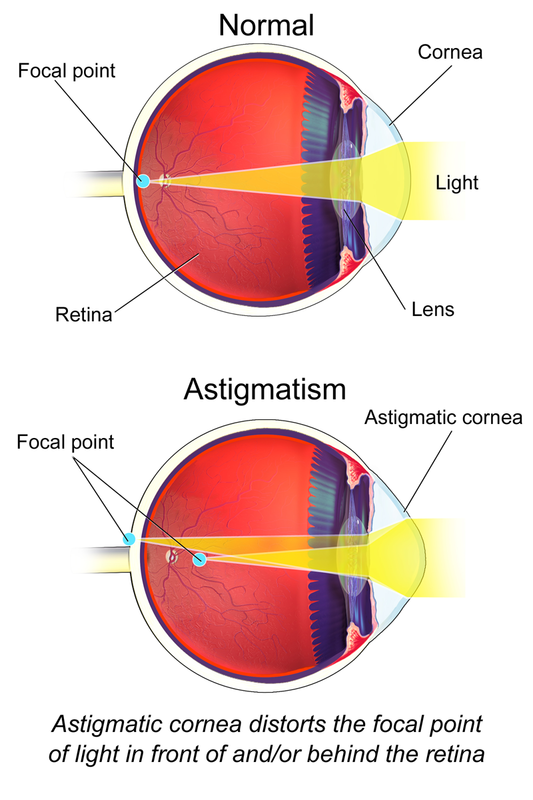 Here the idea is that the power of the lens varies gradually from the top of the lens (which is diverging) to the bottom of the lens (slightly converging) — including the astigmatism correction as well. A consequence of an all-in-one lens is that not all the field of vision can be sharp at once. If I look out the sides of my glasses, things are a bit blurry. But one has to remember with vision that the brain is just as important as the eye. Although the blurriness is there (it was very apparent when I first put the glasses on) after a few weeks of wearing them I just don’t notice it any more. Where I want to look is always in focus, and that’s what counts. Eyeglasses with a progressive trifocal prescription. And that’s made switching my gaze between books, computer screens, visitors in my office and the view of Mt Te Aroha from my office window a whole lot easier. *The same couldn’t have been said of my father. He was very myopic (short sighted). His mother discovered this when my Dad was very young, following a conversation that went something like this. Dad (about 4 years old, waiting with my Grandmother at a bus stop). Mummy, how do you know which bus to get on? Granny: Because we can look at the timetable which tells us which number buses go where, and the times they go. So to go home from the city, we need a number 12 bus. Dad: Yes, but how do you know which bus is a number 12 bus? Granny: Because it has a big ’12’ written on the front of it. **Contrast this to the way a camera focuses. With a camera, the lens is of fixed power – to focus the lens moves closer to or further from the sensor.